I follow and sometimes chat with Collings online, and I see him at conferences and conventions sometimes. When an author is this accessible, you sometimes forget that in addition to being an all-around nice guy, he is also a damn fine writer. I was reminded of that as I listened to "Strangers." Strangers has a literary--but not pretentious--writing style: visceral descriptions, deep character penetration, rich verbs that clench the scene. I loved how insightful the descriptions and narrative were--they added a whole other level of depth to the novel. The characterization was fabulous. I felt like I really was inside the head of a tired, desperate, lonely, forty-something man. That sounds depressing, but it really wasn't. The character's voice is authentic and active, and even when he's exhausted and terrified, he's fighting, It was easy to follow along with the ride. And the pacing was perfect. It grabbed me, it held me. The slow amping of tension as the family grows more desperate. The increased revelation of secrets. The twists on the classic horror tropes. lt was all great. Plus, it had the possibility of a sequel, which would be nice. All in all, if you're looking for something to sweep you away while you put miles on the car or treadmill or load the dishwasher or fix the car or put on your makeup for the umpteenth time, this is a good pick! I'm thrilled that Collings has an Audible presence now and I and look forward to scooping up his other works. This is a great book! To be honest though, having both listened to the audiobook and read it in print, I would try to get a friend to read it in print first. But that is no fault of the narration of the audiobook. I just think this is one of those books that is great to read. I thought the narrator did a worthy job and put a good voice to the book and characters. This book is pretty disturbing. This is a great book for anyone that likes horror and thrillers. 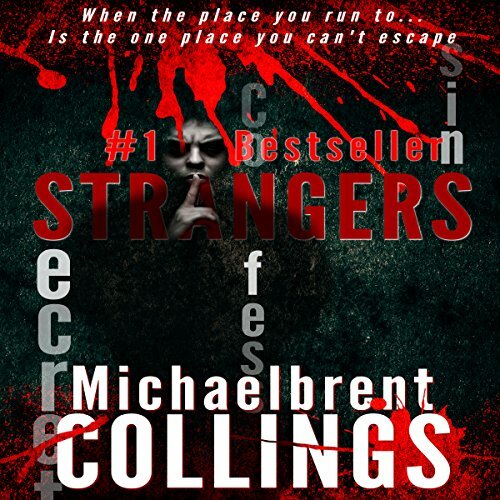 Would you consider the audio edition of Strangers to be better than the print version? Yes, just because the addition of the different voices and especially Jerry's internal monologue allows the narrator to adapt certain affectations that add to the storytelling experience. What other book might you compare Strangers to and why? I'm not sure of any books I'd compare it to, but in terms of movies there is a good deal similar with the Cube series of movies only instead of literal booby traps it's the characters secrets in Strangers that cause most of the conflict. In terms of just being a book in which a family is forced to confront their problems there are many examples. I liked the performance of Jerry, the patriarch of the family. Jeffrey did a good job of portraying his increasingly frayed hold on reality and his vocalizations of Jerry's voice brought to light the amount of self-doubt and guilt that Jerry had throughout the situation. It provided the most intense sensation of the loss of hope in the face of that kind of situation out of the characters. If you could rename Strangers, what would you call it? I might just rename it Stranger, because when you get down to it it's only really one stranger who matters in the story. Of course the plural version can be said to extend to the fact that the neighbors and companies and whatnot showed how much strangers people can be with those they interact on a regular basis so perhaps the plural version is better for that regard. I received the code for this story in exchange for an honest review, its the second book I've been entertained with by both Michaelbrent Collings and Jeffrey Kafer and both of them are remaining on the list of authors/narrators to look out for. Loved ones become strangers in this suspense! I would say that it's a toss up. The writing is so good that it drags you along, but the narration is so spot on and the tension so well created that it's almost impossible to say that one is better than the other. I have no favorite character. Each character is detestable, each character has some sort of hidden flaw that's being forced out into the open, and each time it shows just how selfish people can be. It was. I almost did too. The only reason I couldn't is because I really did have to get some sort of sleep and had to keep my phone/tablet away from me to keep the temptation away. I received this from the narrator, Jeffrey Kafer to review. I’m more than glad I did. There is something about audiobooks for me that take me a minute to get into them. It takes me a minute for my mind to really get wrapped around the story……not this time. The combination of incredible writing and incredibly acting by Kafer pulled me in from the get go. The absolute, cut the air with a knife, tension that Kafer is able to create when the scenes crescendo to climax after climax makes you stick with the story. You think you can just turn it off and come back, but in reality, you’ll need to listen more. He has stated that this was one of the most difficult books to narrate due to some of the more violent scenes and you can really feel that come through. I won’t tell you which scenes here so as not to spoil anything, but you can really tell that the struggle he had during scenes weren’t really acting, but real. Don't ever stick me in this situation! Where does Strangers rank among all the audiobooks you’ve listened to so far? The story is dark and gripping. The narration is great. Jeffrey Kafer is one of my favorites. This was freaky. This is one of your worst nightmares that just is pure survival. When there is a death that happens and questions are asked yet the others are wanting to go. (A bedroom scene). That sounds so messed up but it's to not give away anything. Who was the most memorable character of Strangers and why? This is a fast paces story. Dark. Nightmarish. Sticks with you. What was one of the most memorable moments of Strangers? This audio book has everything a horror fiction fan could want in a novel! The intense, suspense takes off right from the beginning. You might think that at some point it would let up while the author focuses his energies in different directions, but not so! Even while the plot progresses and some things begin to come to light, the mystery and tension continue to build. Lots of action from beginning to end. If I wasn't already paranoid about who came into my house, I definitely would be after listening to this book. Michaelbrent Collings writes a very believable family, one who suffered a terrible loss the year before. Jerry, the father, wants them to be together on the anniversary of his son's death for a dinner and movie night. But they don't make it past dinner before things go downhill. The family wakes up to find they are trapped in their home by a killer who seems to have thought of everything. And he wants you to confess your deepest darkest secret, if you don't he will expose it for you. It was very easy to imagine what I would do in situations throughout the book, and I was still surprised by the ending. Jeffrey Kafer does a wonderful job with the narration. He is very easy to listen to, you know who is talking at the time, and he even gets the inner monologue in a different tone so there isn't any confusion. Audiobook received for an honest review. Pretty run of the mill home invasion thriller with your usual sadistic game of cat and mouse. I don't think there were any elements here that haven't been well covered in other books, but some scenes were jarring and intense and the twist at the end was well done. The main character was, at times, pretty irritating and often got under my skin, which took away some of my interest in the story. Fairly high. I will definitely give it another listen. Jerry, the father. He did his best to stand by his family in a terrifying situation. Mr. Kafer delivers another excellent performance. Every character has a distinct voice. Yes. I was tempted to drive right past my in-laws and continue to Florida to see how it resolved. What did you love best about Strangers? The twists and turns. Totally creepy and intense. He had the perfect voice for this book. The Killer, primarily because you never knew much about him or his motivation, just that he was doing all of this. It is so nice to see horror that isn't Zombie related. This book kept me on the edge of my seat. I didn't know what was coming and was thrilled to see the culmination. It came together very well! Had to listen to the whole thing in one sitting as I couldn't find a lull in the story to stop. Fast-paced, good narration.